Currently it is developed in Debian Linux, but should work in Windows too (not tested). Also note it is in early alpha stage, so use it at your own risk. 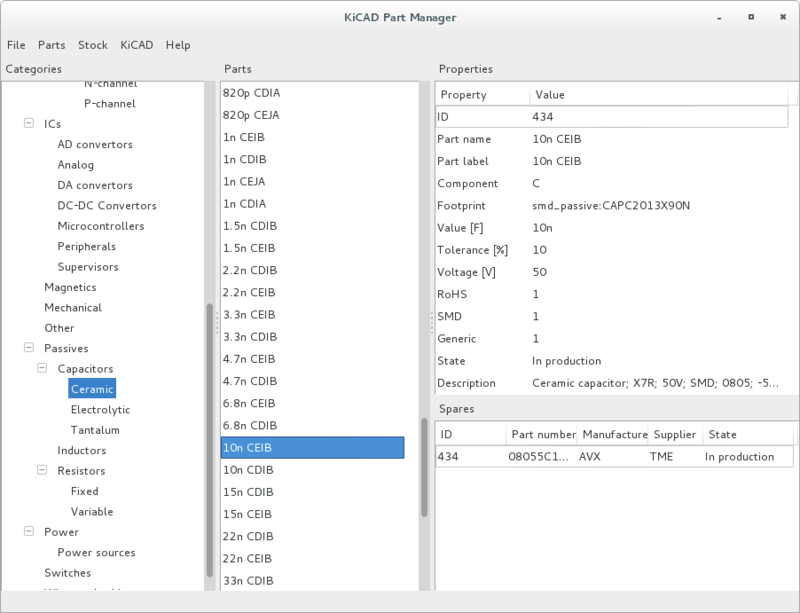 Install all software mentioned above and unpack KiCAD Part Manager to any folder. Then create new MySQL user and database (for example kicadpartman) and set access password for the user. In database create schema (import tebles) using file kicadpartman_db.sql. If you want some data in database, you can use kicadpartman_data.sql to create basic component categories and also smd resistors and ceramic capacitors. But it is up to you, if you want to start from empty database or use my basic data. Then edit file kpm_config.py and change the address of database, username and password. That is. Parts - part with unique part name, human readable part label (this will be value in KiCAD and may be the same as part name) and other usefull properties. Parts should be categorized by type and parameters. every category can have three parameters, that may be used for searching or sorting. For example transistors can have maximum power, voltage and collector current. 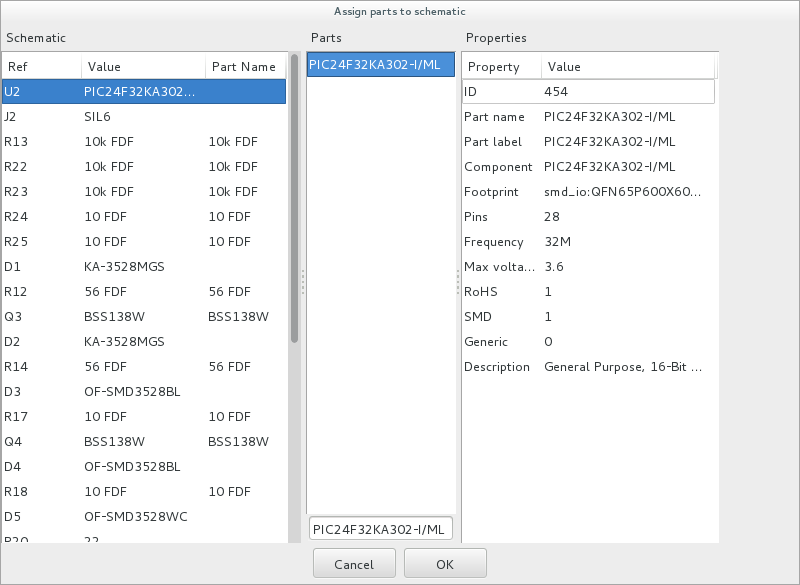 For every part enter unique part name, component (schematic component in Eeschema) and footprint from Pcbnew library. It will be used by assigning parts to components from KiCAD schematic. Other properties are optional, but very usefull, so fill it carefully too. 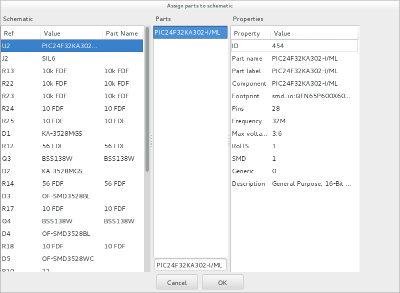 Then fill spare part numbers, they will be assigned when creating bill of materials. Then you can assign parts to schematic components by opening your schematic file. Then find your part for every component and double click on it to assign (you can select more components at once). then save it and the part id, part name and part label are assigned to components in schematic. Open schematic in KiCAD and see the changes. After you are done with PCB design, create BOM from Eeschema and position file from Pcbnew and import both to KiCAD Part Manager. The new BOM will be saved to database and can be exported as CSV file for manufacturing. 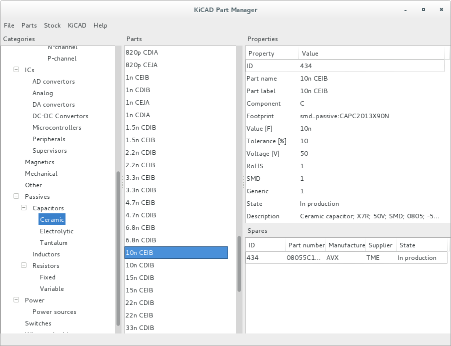 You can use KiCAD Part Manager as stock management system. Receive and dispatch parts and by assigning see number of parts in stock. When manufacturing, dispatch all components by BOM from stock or see, what components are missing. Powered by phpBB-nuke. All rights reserved. Page Generation: 0.540 Seconds, 20 SQL queries.